With temperatures expected to rise above 30C today, it’s safe to say the countdown to summer is well and truly over. It’s here. And as the skirts get shorter, I’m sure that for many, you will feel a slight twinge of panic at the thought of baring all. But no fear, I have a few summer beauty products to help you with your seasonal beauty overhaul, all thanks to Marks & Spencer. I love a multi use product and this luxury cult oil from Nuxe doesn’t disappoint. The lightweight formula is a unique combination of 95.2% natural ingredients, including 30% precious plant oils and vitamin E. It has a lovely light exotic fragrance and although it’s oil, it doesn’t leave you looking or feeling greasy. Spritz into your moisturiser, mix it with your foundation, or spray directly onto the skin and into your hair. When applied to the skin it instantly leaves a golden sparkly sheen (you won’t look like a disco ball) and the vitamin E leaves the skin feeling really soft and moisturised. This dry oil is the perfect product to emphasise your tan - hello bronzed goddess in a bottle! 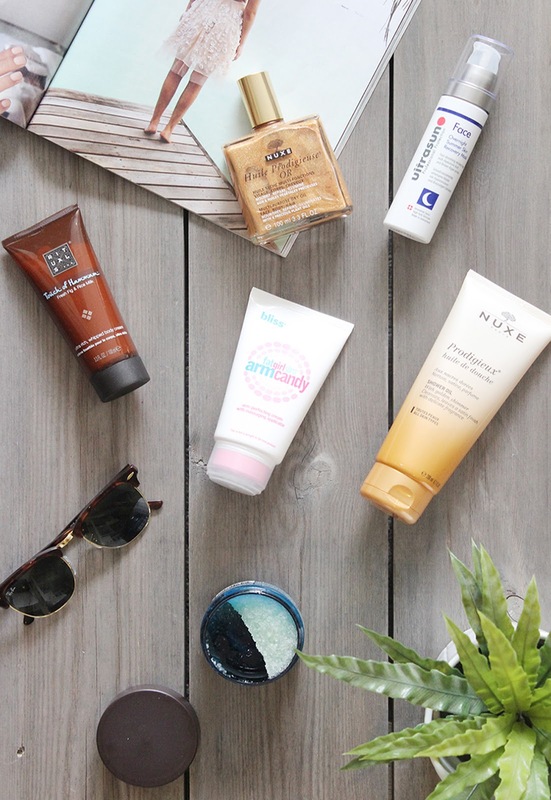 It’s a given that exfoliating and moisturising are a must in the summer months. And for just £15.00 you can renew your skin with the Rituals Discover Hammam Set. The set includes a foaming shower gel, body scrub and body cream. The sea salt scrub is intense and has a sensuous, spa like scent with ginger and eucalyptus. It leaves my skin feeling buffed to perfection and helps to kick cellulite to the curb. Once dry, follow up with a body moisturiser and you’ll have pins ready for a pair of shorts! It’s a no brainer to ramp up your SPF, but how about treating your skin after basking in the sun? New to the Ultrasun range, the Overnight Summer Skin Recovery Mask slowly releases hyaluronic acid and powerful brown algae activies, to deliver long-lasting hydration and overnight, anti-agign care for your skin. The formula is incredibly fast-absorbing and lightweight with a non-greasy texture. This recovery mask is great for those with very sensitive and dehydrated skin as its free from perfume, mineral oils, emulsifiers, silicones or alcohol. This product offers a targeted solution against the damaging effects of the sun, reducing sun damaged cells by up to 40% and I can’t stress how important it is to protect your skin. Ever wondered what those bumpy, red lumps are on the backs of your arms? Keratosis pilaris (also known as chicken skin) is an inherited condition (thanks mum and dad) in which dead cells and excess keratin build up around hair follicles, clogging pores. So whats the fix? I have found a couple of products, including a bestseller from Bliss the Fatgirlslim Arm Candy which is clinically proven to reduce redness and is formulated with lactic acid which helps to exfoliate dead skin cells and help the skin adsorb moisture. It smells clean and minty and is easy to apply with the massaging applicator. Once massaged into the skin, there is an immediate reduction in redness and with continued use my keratosis pilaris has improved. The only thing I dislike about this product is the subtle shimmer it leaves on my arms, but I can look past that. This product is priced at £34.00 but Marks & Spencer currently offer this product and a Bliss tinted body spray in their Arm & Leg Bundle Gift Set for £32.00. Cult body-oil-turned-body-wash the Nuxe Prodigieux Shower Oil has quickly become my new favourite shower buddy and it's the perfect alternative for those who can’t afford the dry oil. The Nuxe Prodigieux shower oil is a pleasure to use, it’s creamy, iridescent texture gently cleanses and moisturises leaving a satin finish on the skin. This shower oil is certainly one to pack for your upcoming holiday.